We brought a nice lantana back with us from Fort Stockton, a birthday gift for my wife from my brother and sister-in-law. After it was situated on the back porch, Debbie called me to take a photo of what might have been a stowaway on the trip home. He's wet because she sprayed him with a hose before she realized he wasn't a grasshopper. I think he's a little miffed, if the expression on his face is any indication. It's also more than a little creepy the way he follows your movements with his head and eyes. Those dudes are great to have around tho - they munch lots of the other nasties who would otherwise have their way with your pretty plants & flowers. Oh, yeah...they're definitely welcome guests around our plants anytime! I love the expression on it's face! Great photo! Eric, Remember they do like humming birds. We find them bothering our's. Actually, I did not know that. 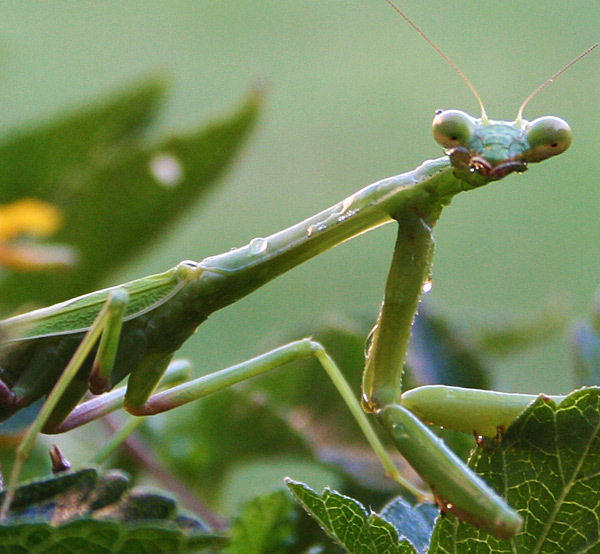 I'm try to figure out how a praying mantis could be a threat to a hummingbird. Do they get in their nests? Eric, you were the one who alerted me to that fact some time ago and I googled it again and it is still there. Praying mantis and humming birds. Not a pretty sight. OK, now I remember! Yeah, that was pretty gruesome. No wonder I blocked it from my memory. As it so happens, the plant on which I photographed the praying mantis is directly below the hummingbird feeder. Tricky devil. How did I miss this one?! Another amazing photo! I don't think I've ever seen a praying mantis up this close. The eyes are definitely probing, aren't they? And also cartoonish. Wow! Gwynne, the way their heads and eyes follow your movements really is creepy. You can wave your hand in a circle a good three or four feet above them and they'll track it as if locked on with sonar. I suppose that's one thing that makes them effective predators. This page contains a single entry by Eric published on August 30, 2009 6:59 PM. Austin to do what the state won't was the previous entry in this blog. Heavy Backyard Air Traffic is the next entry in this blog.